SoftPlanet makes it possible for everyone to get free Robert Browser download directly from our servers. There is no registration needed for downloading. Usually when we work with web browsers we want to have a lot of utilities in order to be able to control our experience on the Internet. But this leads to complicated interfaces or a lot of functions that are hard to manage. If all that you want is simplicity, then download Robert Browser and you will have the web browser that can become the symbol of simplicity among these programs. Robert Browser has only two buttons on its interface and a field where you can type the address of the web page that you want to see. When you enter the website you can click on the button with the interesting name “GOOOOOOOO”. If there is a problem with the page you can Refresh it from the button with the same name. That's it. There is nothing else, which shows just how simple the app is. 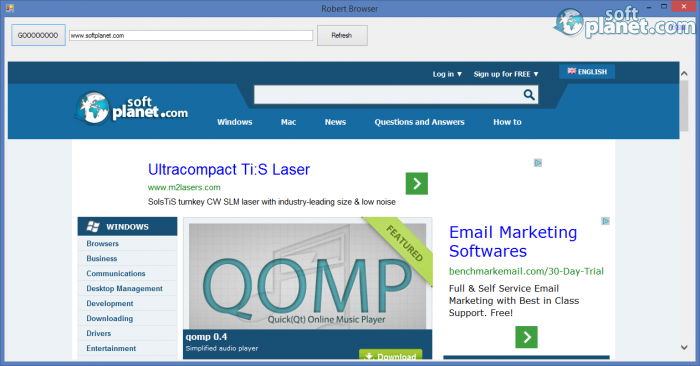 Robert Browser is a free and very simple web browser. If you want simplicity out of your browser, this is the app that you need. Our security scan shows that Robert Browser is clean from viruses. The current version of Robert Browser has been scanned by our system, which contains 46 different anti-virus algorithms. That ensures that Robert Browser 1.0.0.0 is 100% safe for your computer.